Though everyone’s attention seems to be firmly focused on the release of The Dark Knight Rises at the moment, let’s not forget that we have Paul Thomas Anderson’s long-awaited follow-up to 2007’s There Will Be Blood to look forward to this fall. The Master stars Philip Seymour Hoffman as World War II veteran Lancaster Dodd, who’s haunted by his experiences, and decides to form his own religion as a result. Joaquin Phoenix plays a drifter who becomes Dodd’s right-hand man. Though we previously saw a promo poster for the film way back in May 2011, an official first poster has landed online and it’s unsurprisingly great. I’m not exactly sure as to the significance of the wine bottle design other than the fact that Phoenix’s character is a drunk, but I’m loving it nonetheless. Hit the jump to check out the poster, and if you missed the film’s trailer watch it right here. The pic also stars Amy Adams, Laura Dern, Jesse Plemons and David Warshovsky. 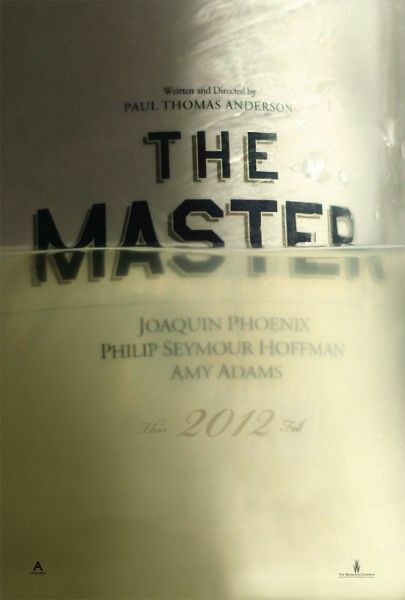 The Master opens on October 12th.